Our late friend Martin Nathan was classmates and old friends with Michael Crichton in Harvard Medical School and subsequently in Los Angeles. My partner at the time, Bruce Westland and I went to the 1984 Los Angeles Olympics with Marty and his partner Sam, and Michael and his wife and had a memorable time. Marty and Michael were both very tall men. 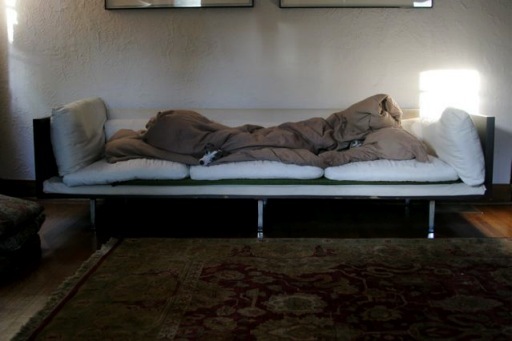 Michael commissioned a couch during the period he wrote “The Andromeda Strain” that he could nap, read and write on. He gave that couch to Marty some years back. Then, in 1986 Marty gave the Crichton couch to Bruce and me. Bruce bought a Lady Kenmore sewing machine and recovered the rotting Naugahyde that covered the couch. Today the couch needs reupholstering and maybe some new legs to make it a bit higher off the ground. We keep an old comforter on it and the dogs have taken it over. I was very sad to learn that Michael died yesterday of a private battle with cancer. I loved his novels and am sad that the stream of his work has stopped. He was always able to take cutting edge scientific discoveries or possibilities and weave them into epic dramas. He was wise enough to be able to foresee the dangers of technologies. I will miss this great writer.